There’s good news for car makers this Christmas: Europe’s new car sales market continued to grow in November with sales up by 1.3% compared to the same month last year, according to the latest analysis from JATO Dynamics, the world’s leading provider of automotive intelligence. The growth rate was lower than in previous months, due in part to sales dips in France (-2.7%) and Germany (-1.8%) when compared to November of last year. However, new car sales in the Netherlands were down by 20.0% year-on-year, the first double-digit drop for any market since July. November’s increase was led by Spain’s impressive 22.0% growth compared to the same month last year. This continued an excellent year in which Spain’s new car market has grown by 19.7% compared to the same period in 2013. There was also strong year-on-year growth in Italy (+5.4%) and Great Britain (+8.0%) as all of the ‘Big five’ markets continued to see positive year-to-date growth. It was another month of mixed fortunes for the medium-sized markets: year-on-year sales rose in the Czech Republic (+11.3%) and Sweden (+4.6%), while there were dips in Norway (-4.9%), Switzerland (-6.8%), Belgium (-7.1%), Austria (-7.4%) and the Netherlands (-20.0%). There was a better picture in year-to-date sales, with double-digit sales increases in 12 of the 29 countries; only five markets have seen sales fall this year. The top 10 high-volume brands continued their successful year; all 10 have posted year-to-date growth. Eight of these also saw sales grow compared to November last year. Volkswagen remained the clear leader with almost double the units sold in November compared to second placed Ford, and a year-on-year increase of 1.2%. Ford has stayed ahead of Renault, but the French manufacturer’s year-to-date increase of 9.2% compared to Ford’s 4.3% means that the French brand has closed the gap significantly during the last 12 months. Skoda kept its place in the top 10 with the highest year-to-date increase among the top 10 brands (+14.2%), despite sales slipping (-1.4%) in November. It was a good month for BMW and Mercedes, as new models saw both manufacturers increase their year-on-year sales by 8.2% and 7.3%, respectively, the highest increases among the top 10 brands. Outside of the top 10, Jeep more than doubled its sales compared to November 2013 on the back of an excellent month for its Renegade and Cherokee models. The new Lexus NX crossover model helped the brand to drive sales up by 68.2% year-on-year, while Mitsubishi increased sales by 32.1% year-to-date thanks to the continued success of its Outlander, ASX and Space Star / Mirage models. 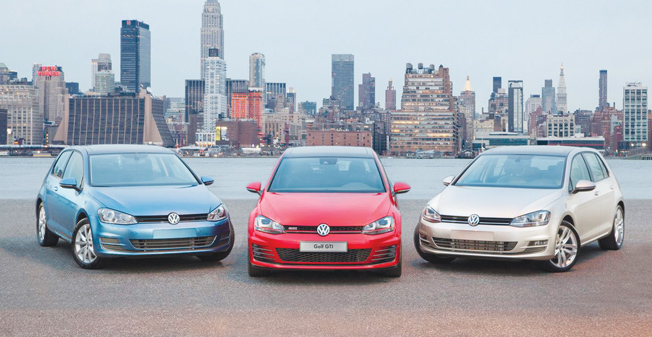 For the second month in a row it was a Volkswagen 1-2 at the top of the best-selling European models table, following continued year-on-year gains for its flagship Golf (+3.2%) and Polo (+12.4%) models. Renault’s Clio was in third place despite a dip (-2.5%) and Ford’s Fiesta was a close fourth with sales down (-19.0%) compared to November last year. Opel/Vauxhall’s Corsa increased sales in November (+5.6%) to place it in fifth. The Peugeot 308 shot into the top 10 models table with a year-on-year sales increase of 70.7%, which has contributed to a 60.2% year-to-date surge in sales, both the highest growth figures in the top 10. This was achieved without taking significant market share from its stablemate the Peugeot 208, which remained in the top 10 despite sales falling (-6.1%) compared to November 2013. Skoda’s flagship Octavia remained in the top 10 despite a drop in year-on-year sales (-9.9%) as the model continued its successful run with an increase of 23.4% year-to-date. Nissan’s Qashqai increased year-on-year sales by 18.8%, the second highest in the top 10 after the 308. The Mercedes C-Class narrowly missed out on the top ten following a 60.6% year-on-year increase in sales for November. Among the mid-volume models, the MINI increased year-on-year sales by 44.2% following the release of a new generation three-door hatch and an additional five-door hatch added to the range. The Seat Leon also benefitted from its new generation, and three-door and estate versions released last year, with year-to-date sales up 43.1%.